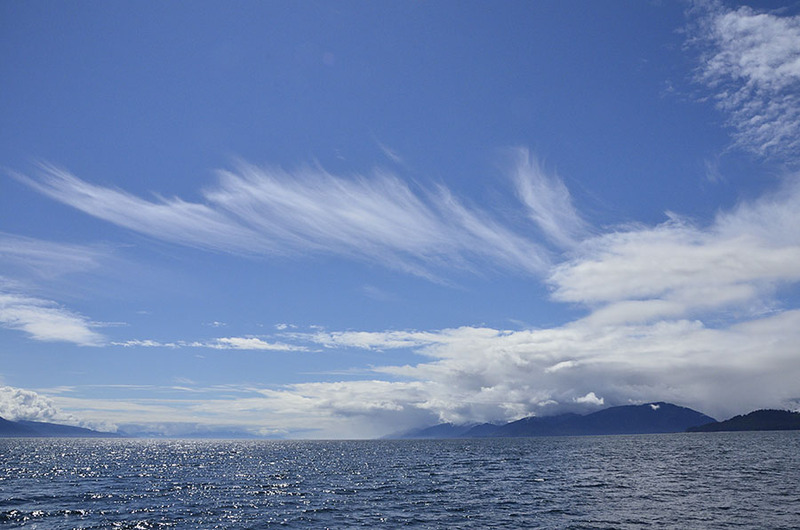 Chatham Strait runs between Admiralty Island to the east and Chichagof and Baranof Islands to the west, geologically part of the Denali fault. This is a “transform” type of fault, where the sides slip laterally. There has already been about 120 miles of lateral slip based on study of the adjacent islands – the west side has slipped to the north. It’s simply beautiful. We haven’t stopped in the tiny community of Tenakee Springs for a few years so we headed there with dreams of their famous cinnamon buns in our heads. Fortunately we got to the bakery just in time to get the last fresh buns, and unfortunately we saw that the bakery is for sale! Residents of the community were in a happy mood because the Alaska State Ferry had just docked, bringing people home as well as lots of boxes and waterproof Rubbermaid totes full of packages and provisions. We watched a constant procession of smiling people rolling overloaded handtrucks to their homes. Tenakee is known for its natural hot springs, plumbed into a small block building for public use. Bathing there is Japanese-style, where you wash in a separate room before you enter the bath. Posted hours segregate men’s and women’s use of the bath throughout the day, important since no bathing suits are permitted. 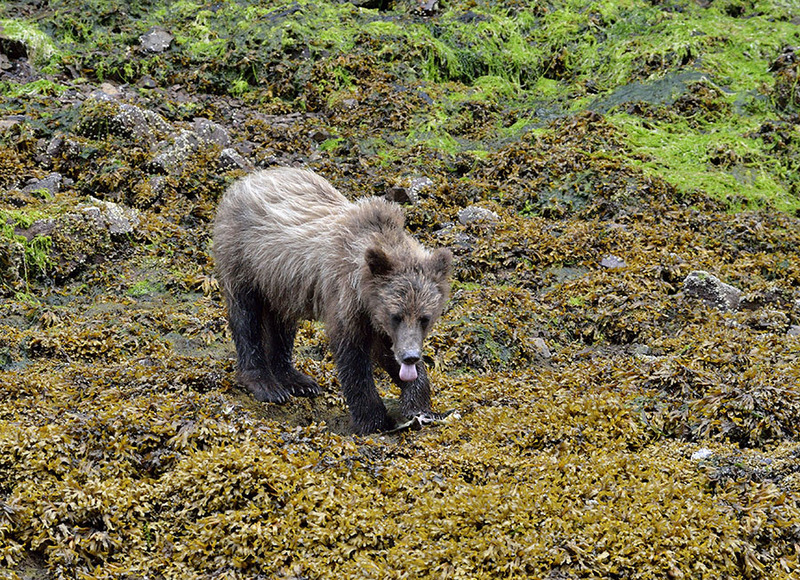 We just enjoyed strolling the “main street” – a dirt road that runs just above the shoreline, noshing on ripe thimbleberries and admiring people’s gardens. 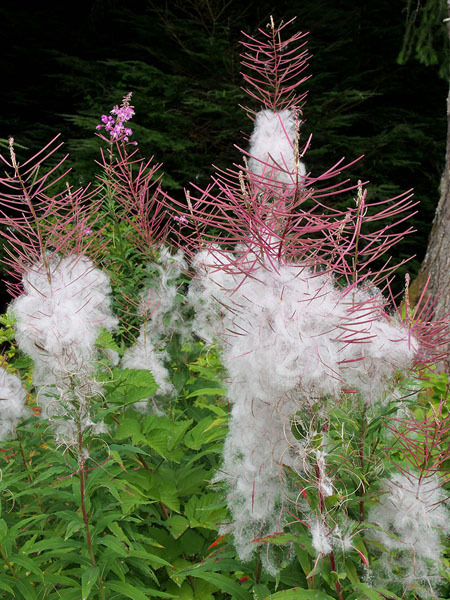 A sure sign that autumn is on the way – fireweed starting to turn to seed. Tenakee is a fun and funky place, where the only vehicles are ATVs and there aren’t enough children in town to keep the school open (a community needs at least 10). 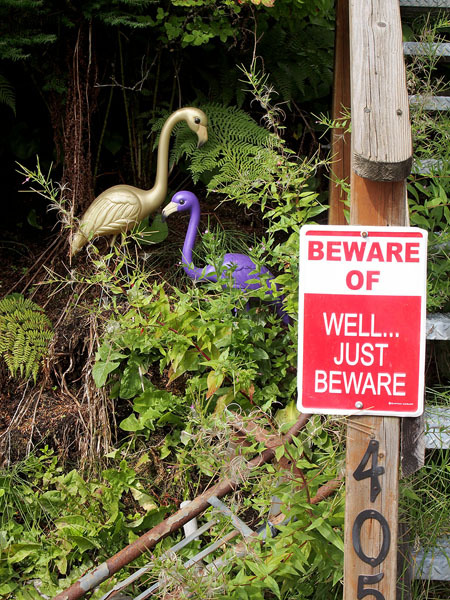 Residents are friendly, and they have a good sense of humor. 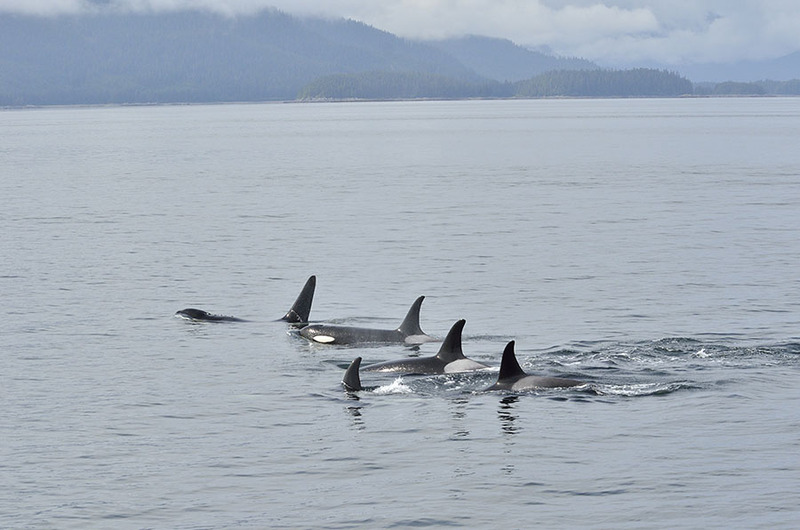 Leaving Tenakee we had a long passage to our next anchorage, interrupted by a pod of orcas! 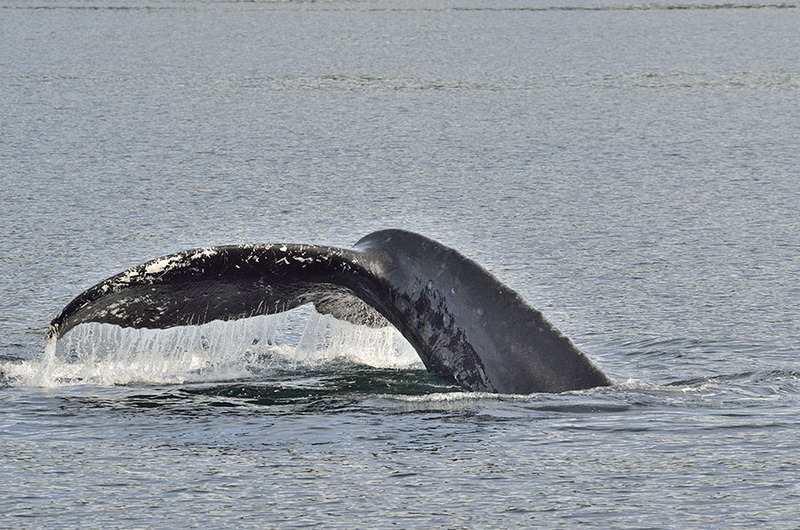 The big dorsal fin belongs to a male – that fin can be up to five feet tall. 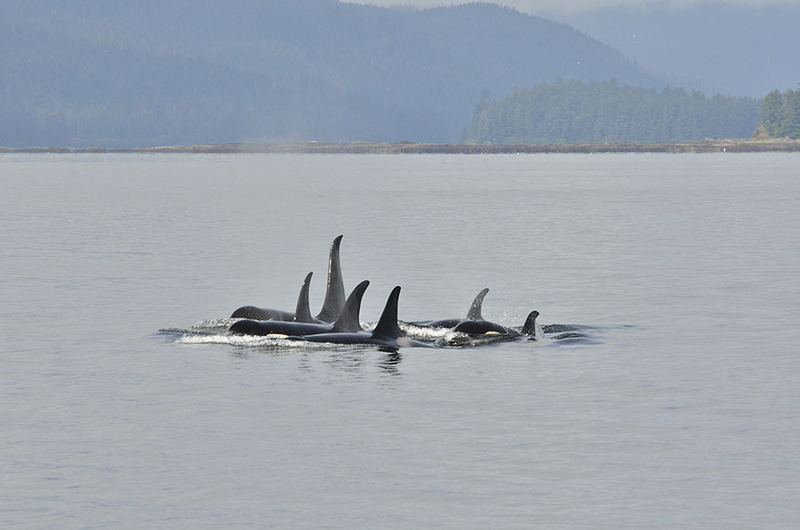 We saw calves as well as adults, and luckily they were moving in the same direction that we were. At one point they all dove, and then popped up close to the boat! 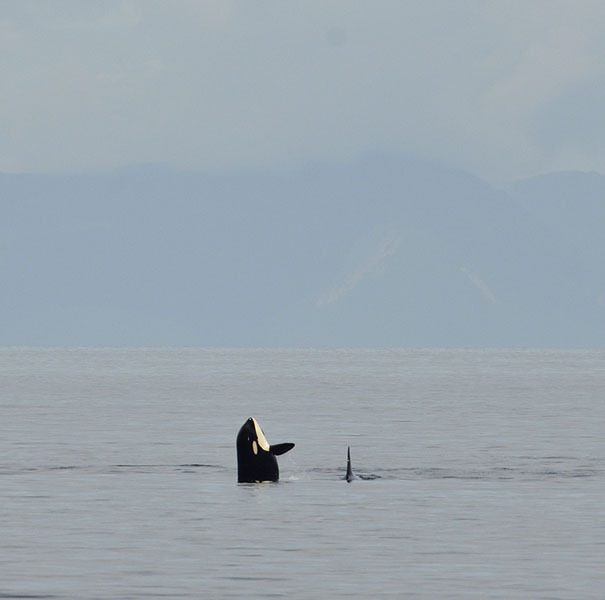 As they dove and moved off, following whatever food they were hunting, one of the orcas slapped its pectoral, slapped its tail, and then spy-hopped. What a show! 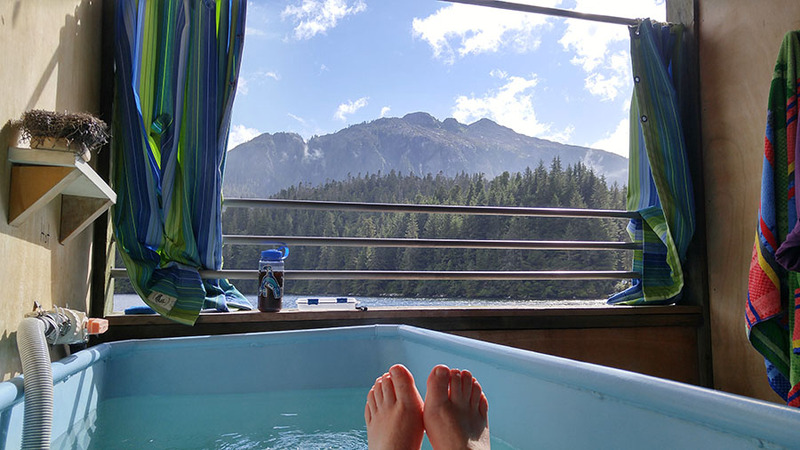 We anchored for the night in a pretty spot where we’ve stayed many times before – Takatz Bay. The water was very silty, turning it into a pale turquoise color. I love how it looked against the forest’s many different shades of green. 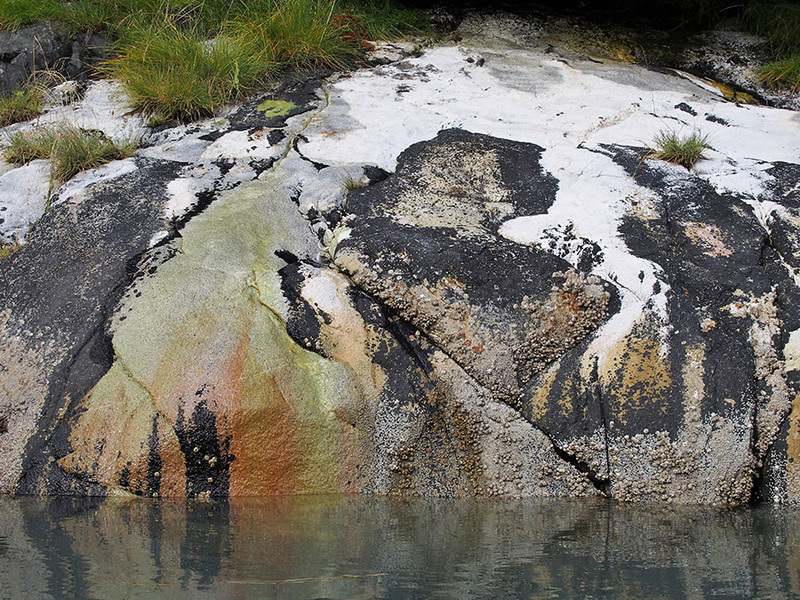 The rocks in Takatz are very photogenic, many with stripes like a tiger’s, and other colors caused by water and lichens. 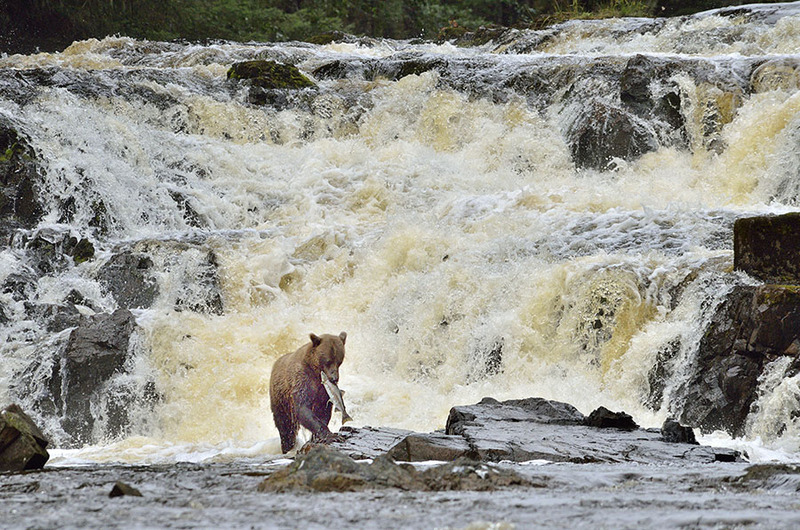 Takatz has a stream, but it’s not a major one for the salmon. 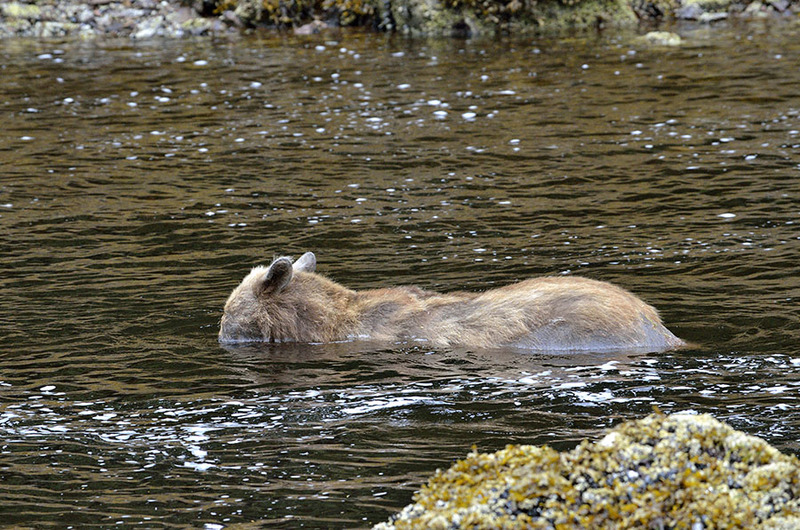 A few fish were around, and a brown bear was napping by the shoreline – the first one I’ve seen there. 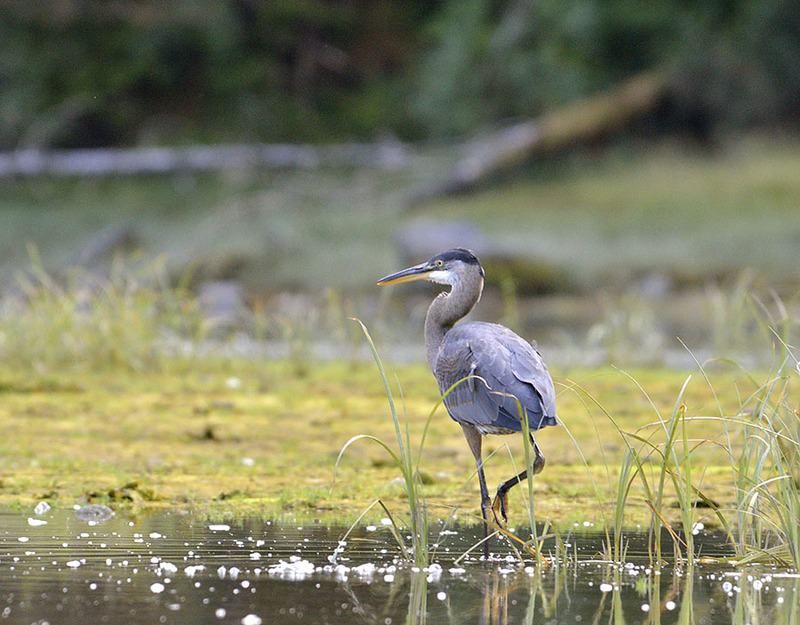 As the tide rose I spotted five blue herons fishing in the shallows. 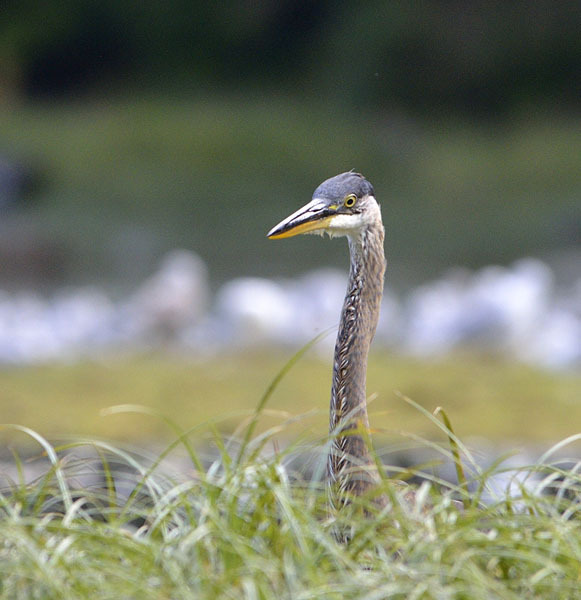 It seems strange to see a bird that we always thought of as a summer or southern resident on the east coast, but we have them up here year-round. 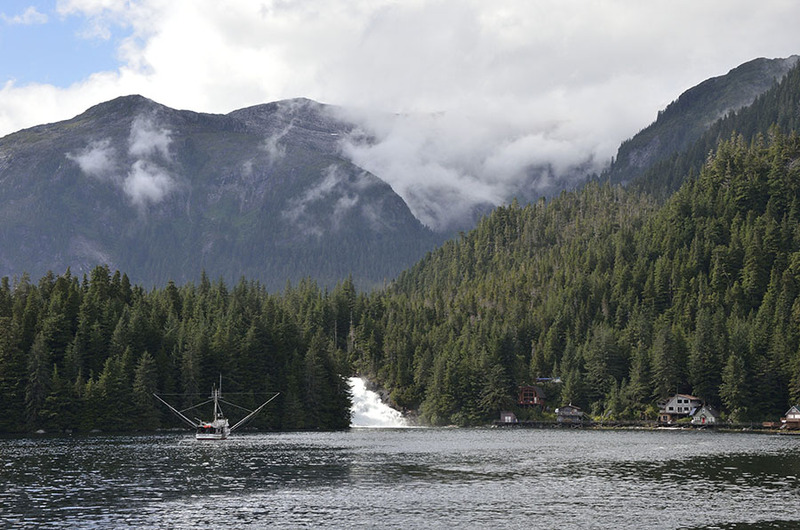 A short five nautical miles south of Takatz is Warm Springs Bay, part of Baranof Island’s “waterfall coast”. 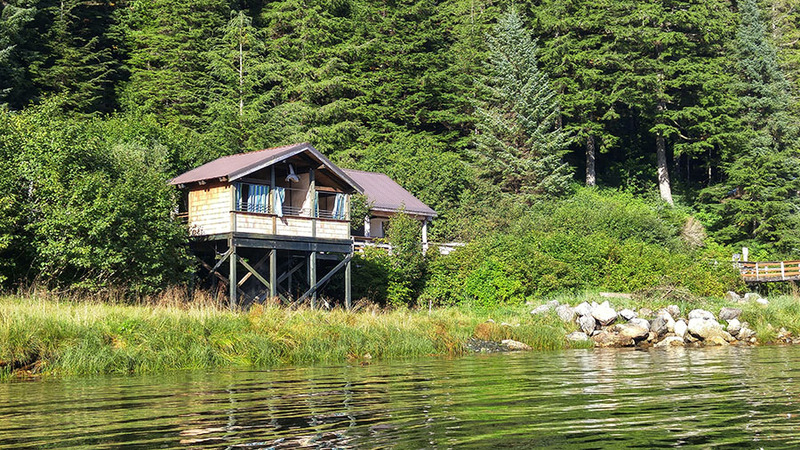 There’s a roaring waterfall and a tiny cluster of houses along a boardwalk overlooking the bay. 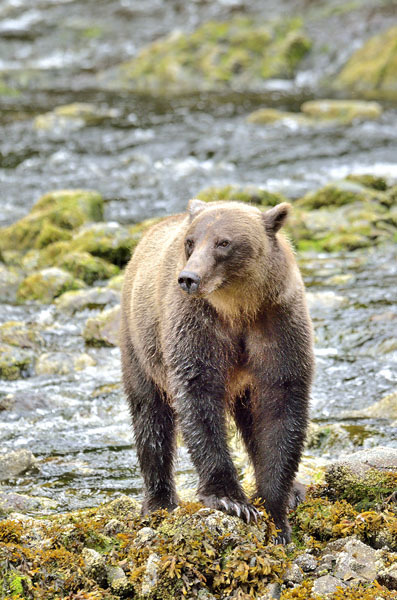 As the name implies, there’s a natural hot spring nearby – access to the rocky pool requires a hike through the woods, but there’s also a little bath house with three private “booths” so you can have a nice soak without climbing over rocks and roots while carrying your bear spray. It’s divine. 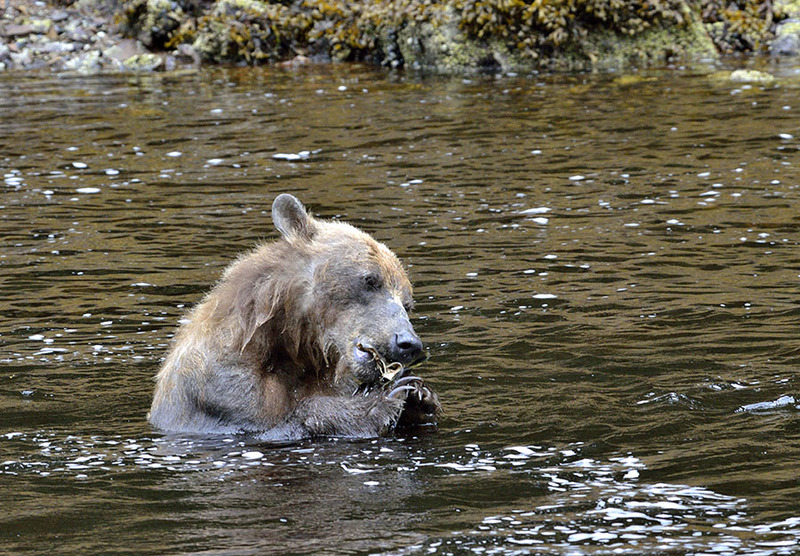 Spending several days watching the Chichagof bears gave us a ton of photo opportunities, and I’m going to bore you with one last set of photos of the brown bears that I adore. First we have some (we think) boars that had a bit of a stand-off. 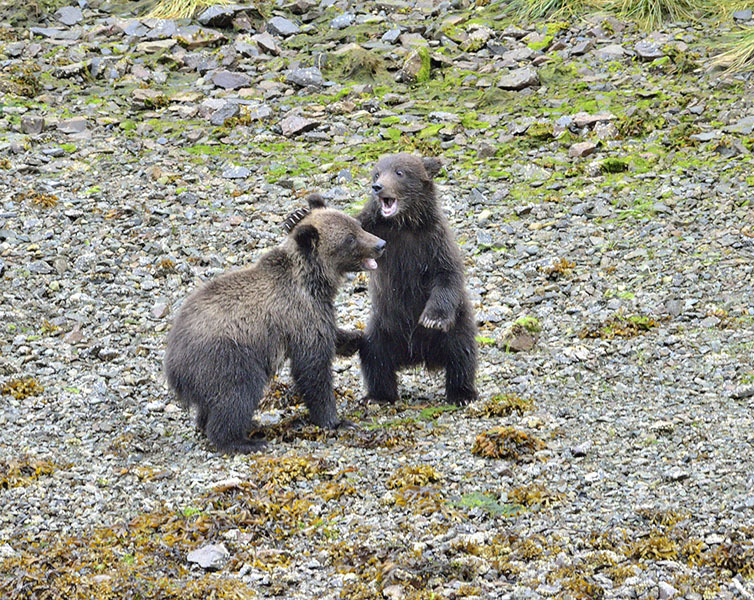 The bear on the left wanted to challenge the more dominant bear on the right, so he got close and they occasionally bared some teeth at each other. 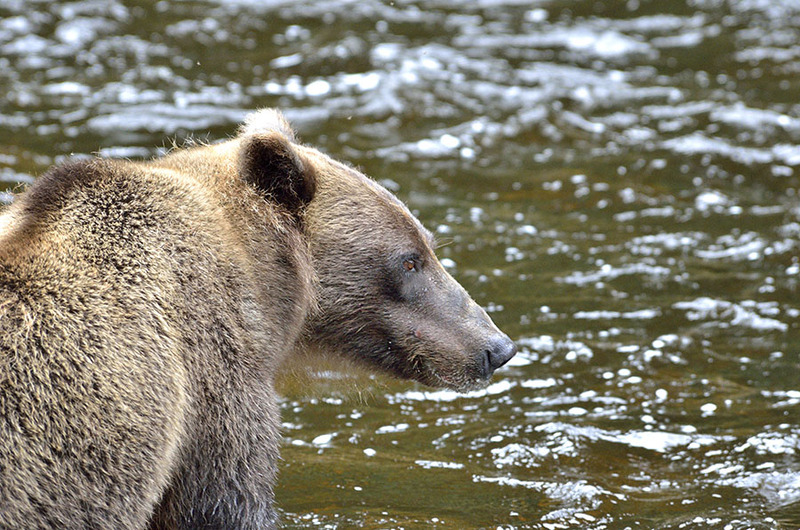 Another bear came out of the woods across the stream and that provided a temporary distraction. The posturing continued on-and-off for a while, and the challenger eventually gave up. 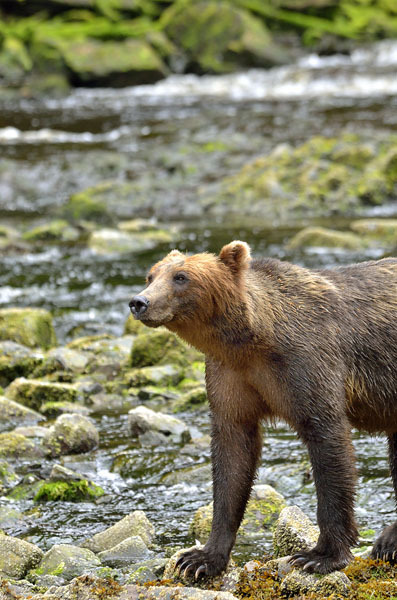 Bears have a definite pecking order, and they seem to know their place without too much fuss and bother. 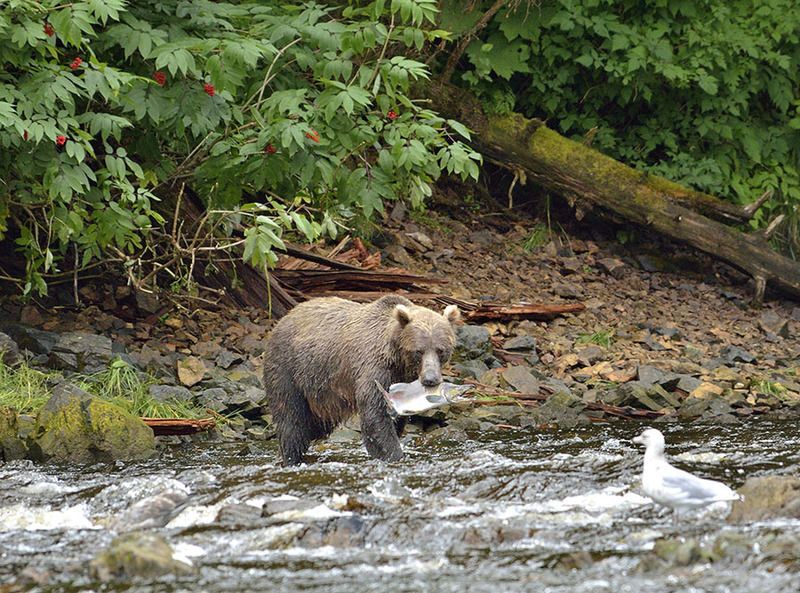 This poor bear kept trying to fish, but had to hop up out of the way whenever a more dominant bear moved into the area. 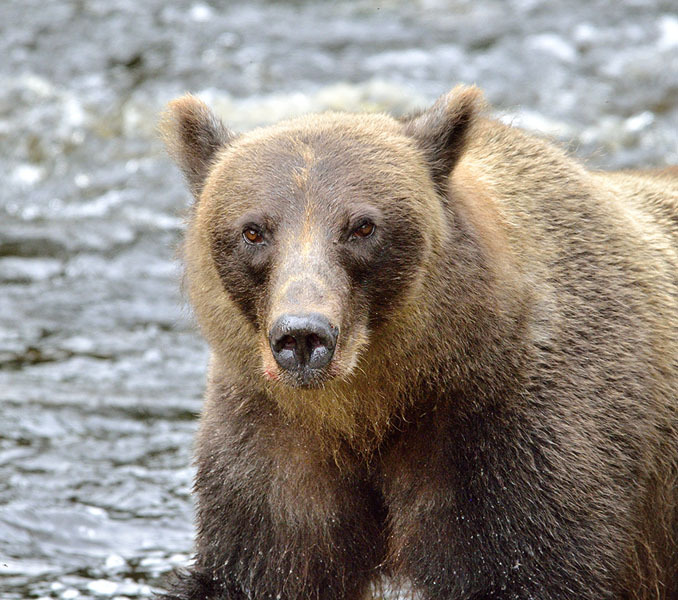 You can see his frustration – bear’s faces, particularly their ears, are very expressive. 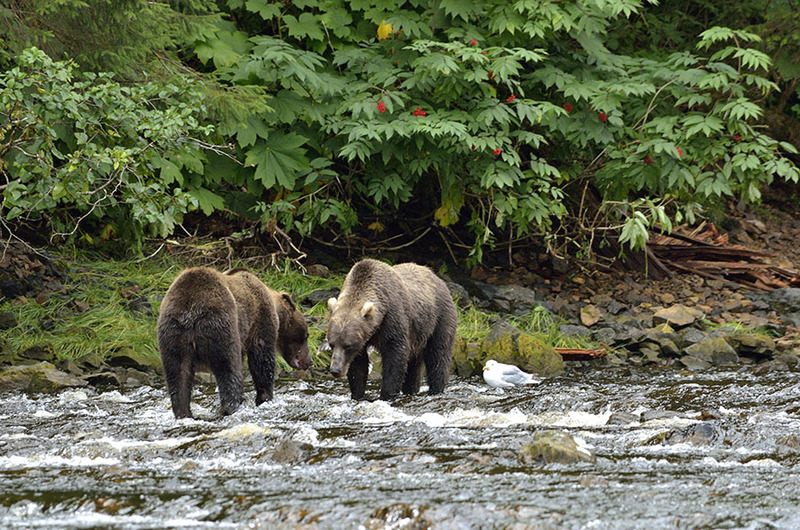 All the bears we saw, sometimes as many as six or seven at a time, were successful catching salmon. Of course, claws like this make hunting easier. 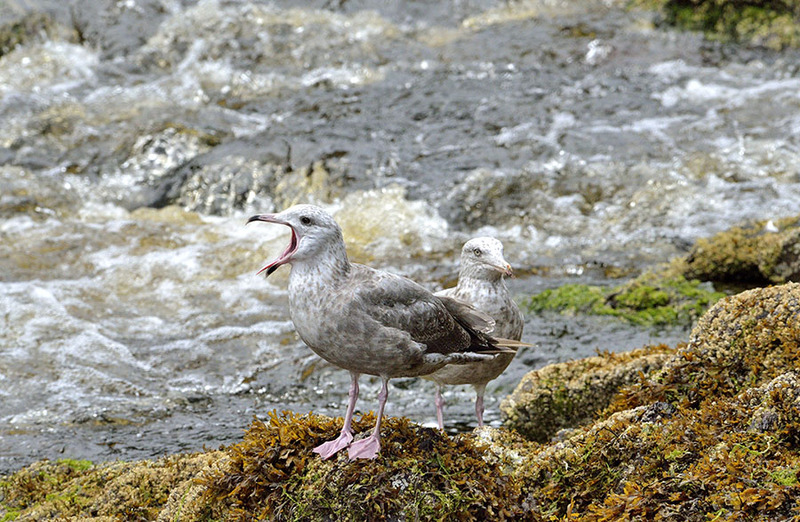 The gulls were plentiful (and noisy), happy to pounce on scraps the bears left behind. 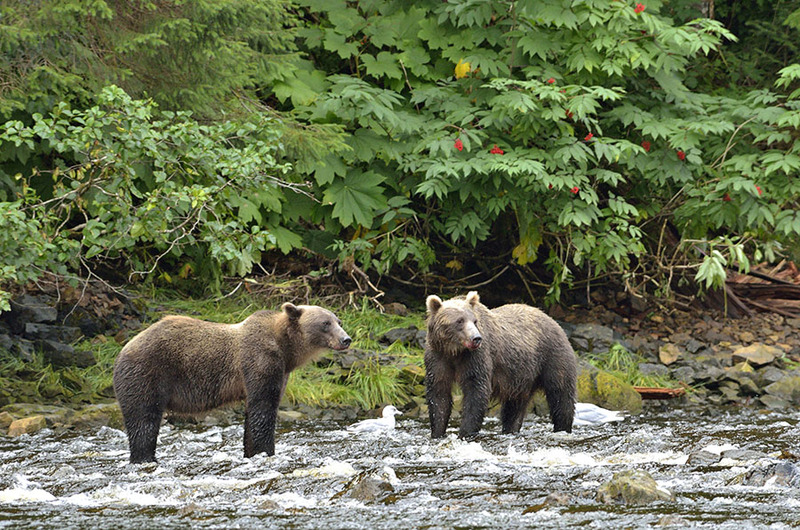 Bears are beautiful… …and a boat that can take us to the bears is even more beautiful. 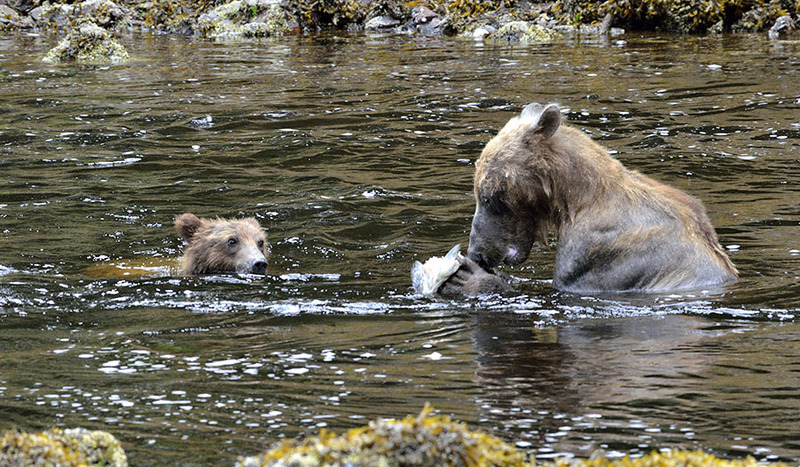 …though her cub didn’t seem to appreciate the scraps she left. 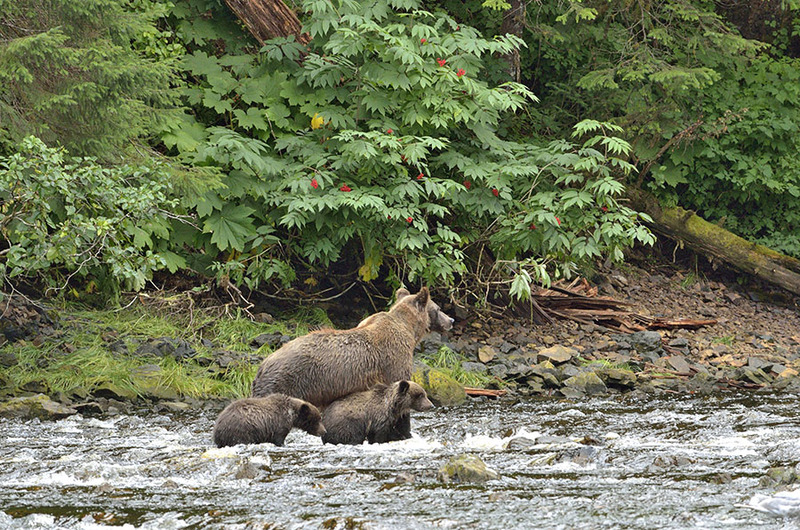 Another sow was a frequent visitor to the stream with her two first year cubs. 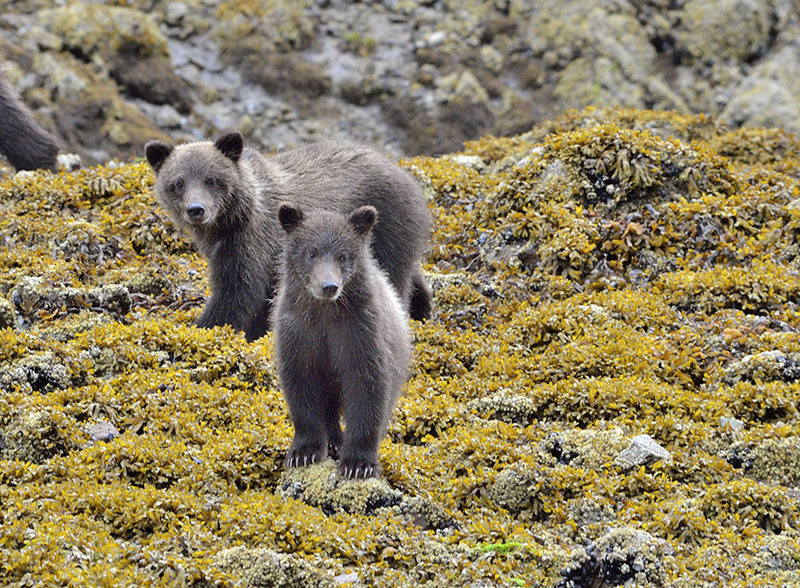 Cubs are born in February or March, so these little tykes were only about six months old – so cute! 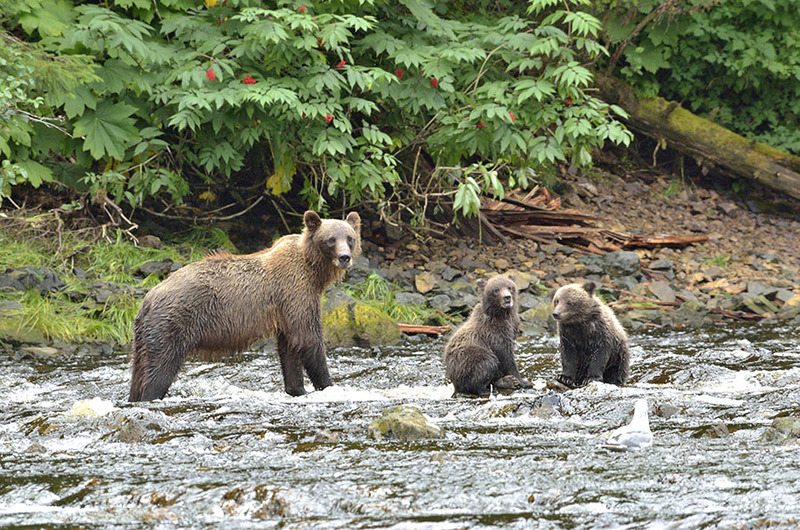 Another bear came into the stream to fish, and the cubs tucked in close to mom just in case. The cubs got more bold as they spent time in the stream, though one cub learned the hard way that the current can be swift! 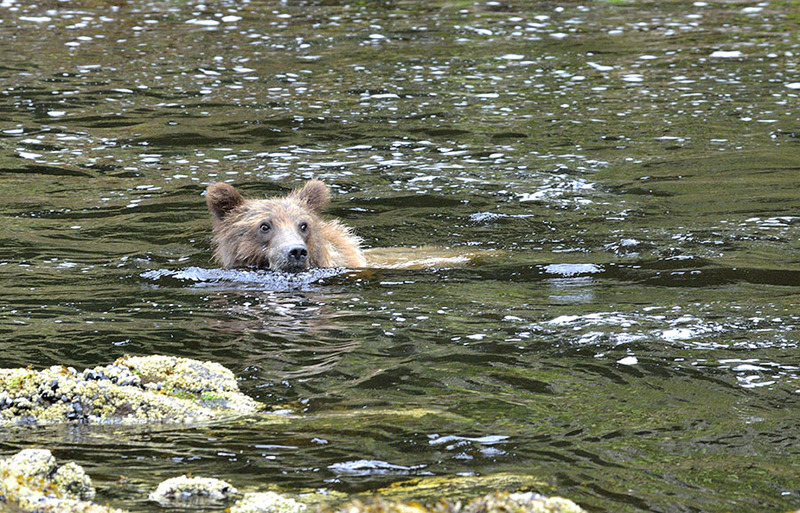 This cub was trying to swim to mom and got a little panicked when it got swept downstream, but it finally got into water shallow enough to stand up in. What’cha got there mom? Can I have some? 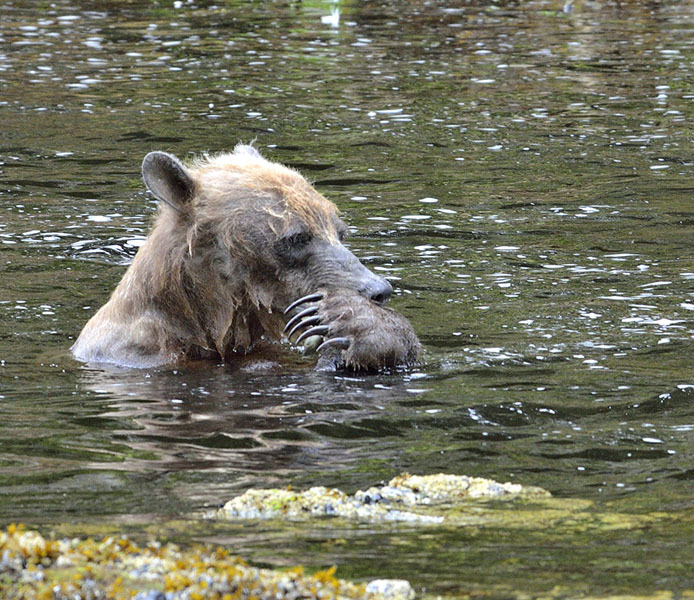 (It’s interesting to see bears in the water since it really shows their powerful muscles hiding under all that fur.) 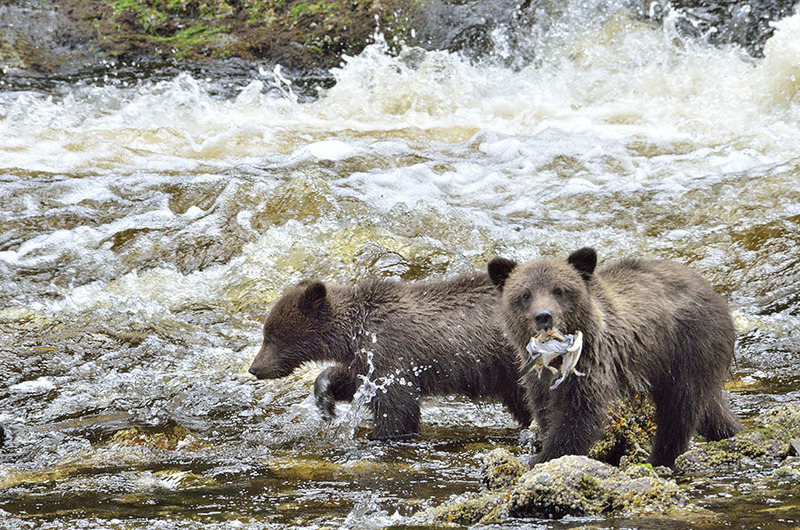 The little cubs got into the shallows and found a scrap of fish of their own… …and the young hunter was not inclined to share with its sibling! We got to watch them play-fighting… …and no matter what they did, they melted our hearts! 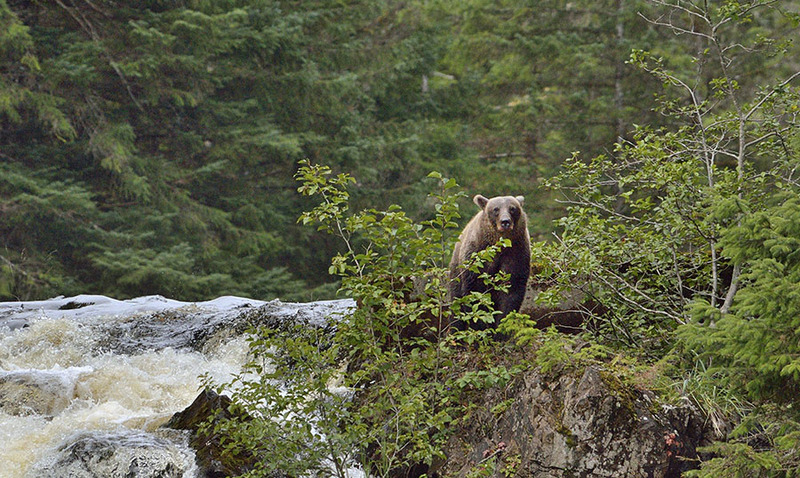 There’s plenty more bear action to share – stay tuned. 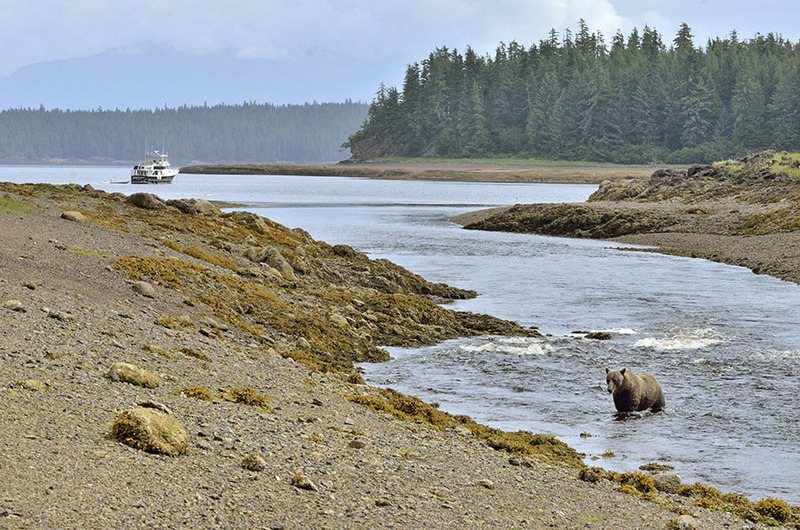 Leaving Pack Creek we have to spend several hours cruising through Seymour Canal – an area known for good whale activity, which did not disappoint! 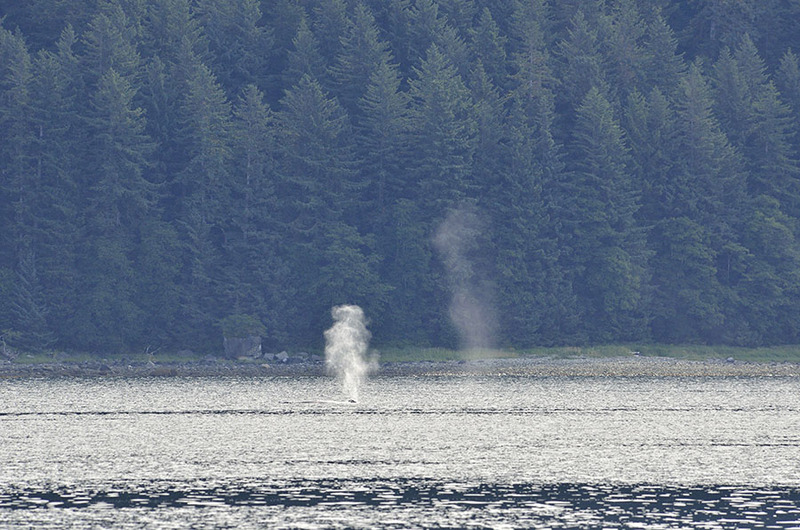 We saw lots of blows towards the east side, and before we even headed over that way some more whales showed up pretty close to us! 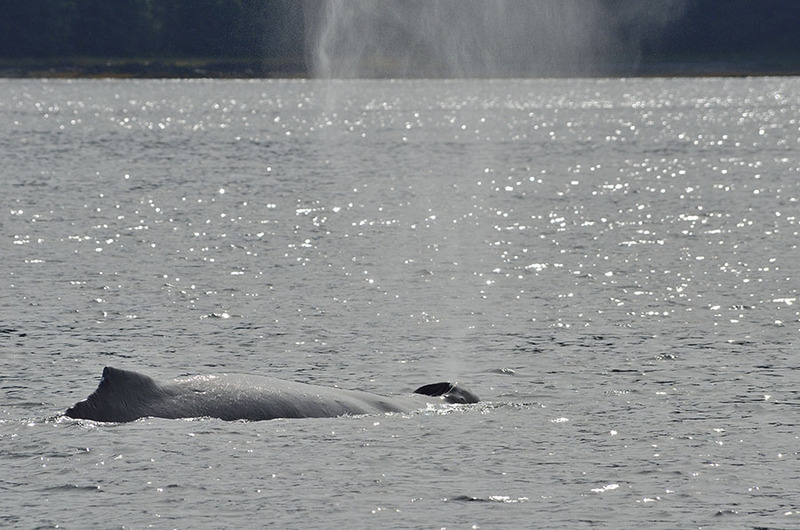 We kept our distance and watched them for a while as we cruised south. 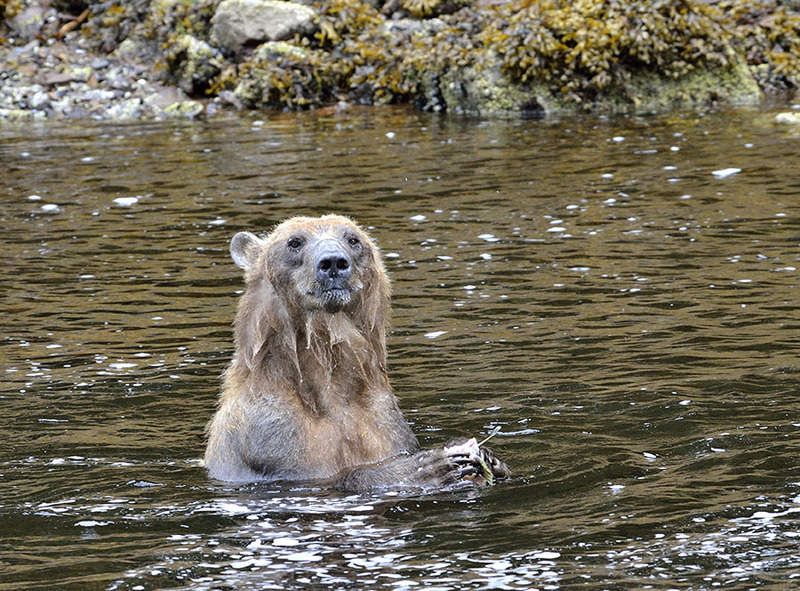 After all the great bear action, it was fun to see a different kind of mammal up close! 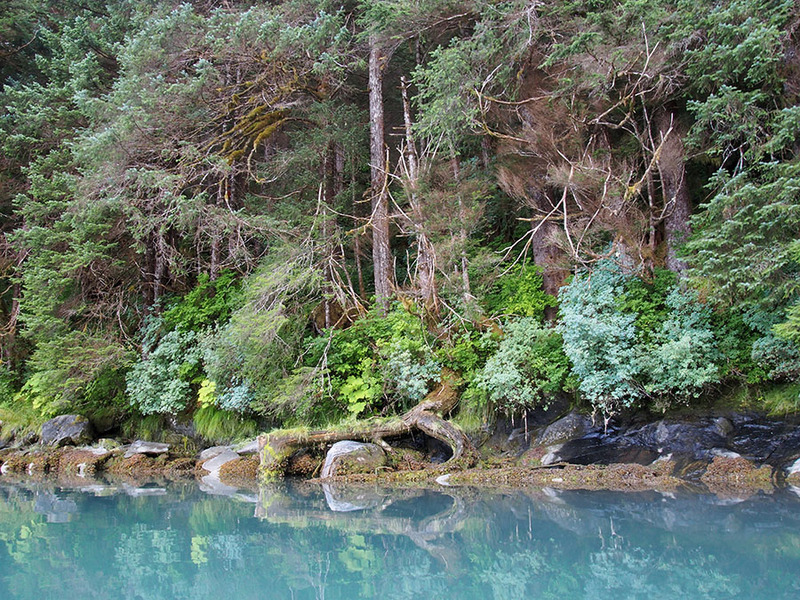 We stopped back in Juneau, careful to time our arrival in Auke Bay harbor. 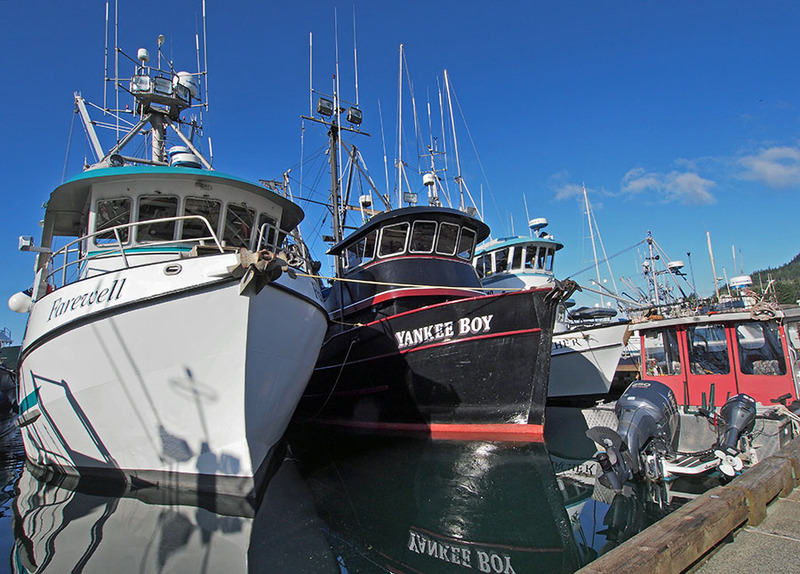 Auke Bay’s transient dock space is completely uncontrolled – you just tie up anywhere you can find a spot big enough, and hope that there’s some room in the nearest shared power box. It’s not our favorite place, but it works when we need to go to The Big City. 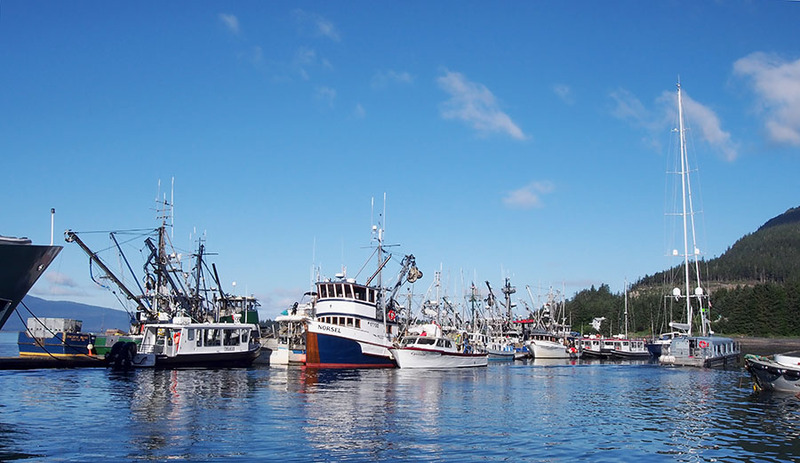 Auke Bay is also where the whale watching and charter fishing boats tie up when they’re not taking cruise ship tourists out for an adventure, so we try to time our arrival when those boats are usually out. 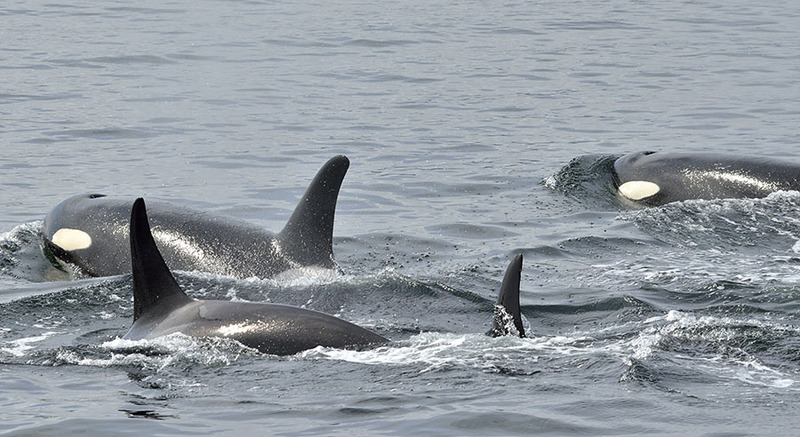 Fortunately for us, we found the last big spot about 1/2 hour before the local gillnet fishery closed and all the gillnet boats headed into port! 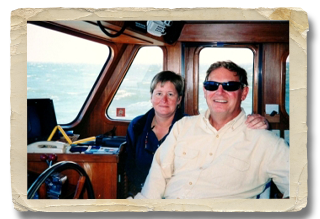 The gillnet boats are typically 32-40′ long, and there were so many that they had to raft to one another – three deep! 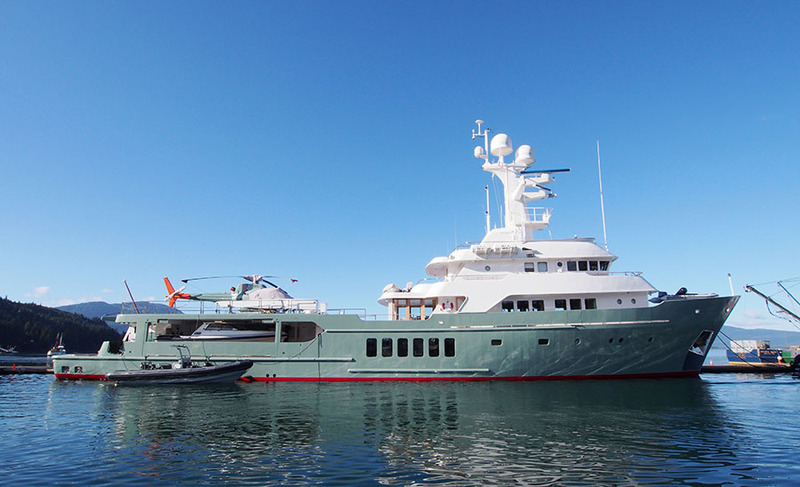 If you look in the background on the far right you’ll see this monster… a 160′ yacht with four-person helicopter (and several other toys)! 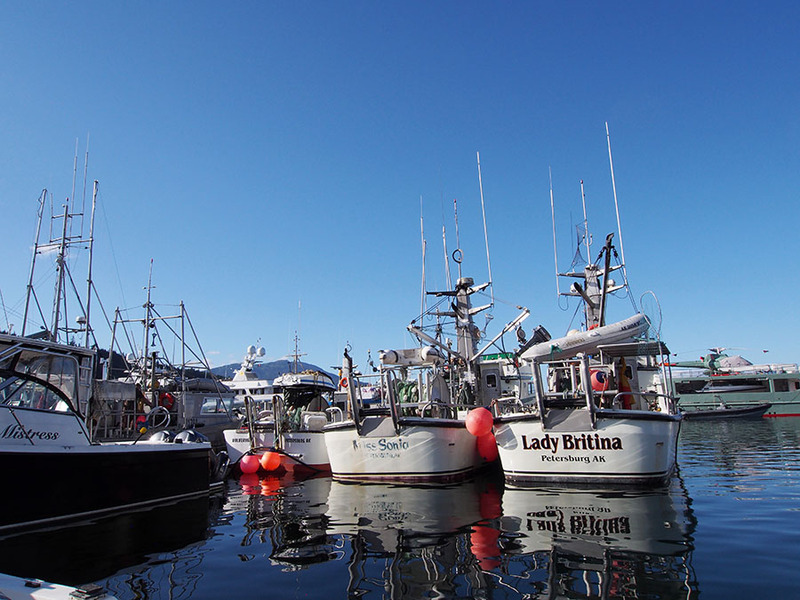 There were a few other large private yachts out on the breakwater dock – they come and go through the summer cruising season since Juneau is a good place to swap guests and to re-provision. About two hours after the Invasion of the Gillnetters calmed down, the seine net fishery in nearby Amalga Harbor also closed, and the monster 58′ seiners swarmed the already-crowded harbor! The fishermen are pretty good about helping one another, rafting boats together and helping anyone who might be trapped by the bigger boats. It’s a pretty cooperative arrangement – sometimes stressful, but it works. 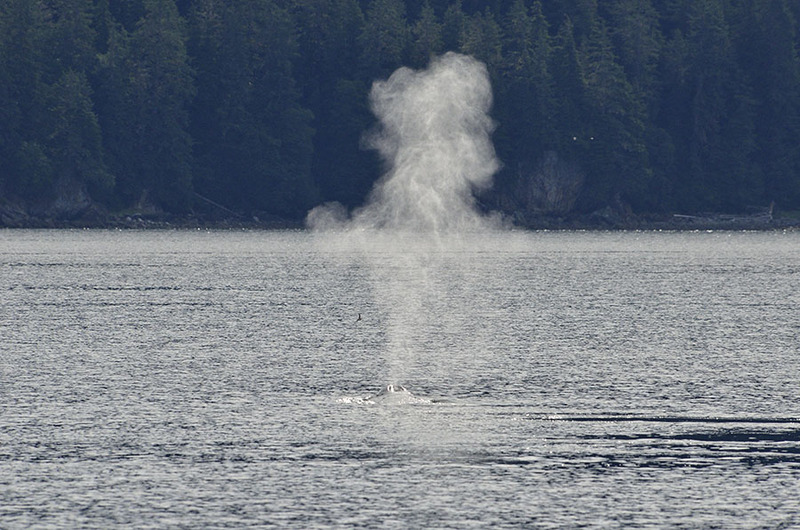 It’s not always this crazy in Auke Bay, but when the fishing is active nearby and the downtown harbor is full of cruise ship passengers wanting to see whales or go fishing, it’s a lively, fascinating place. 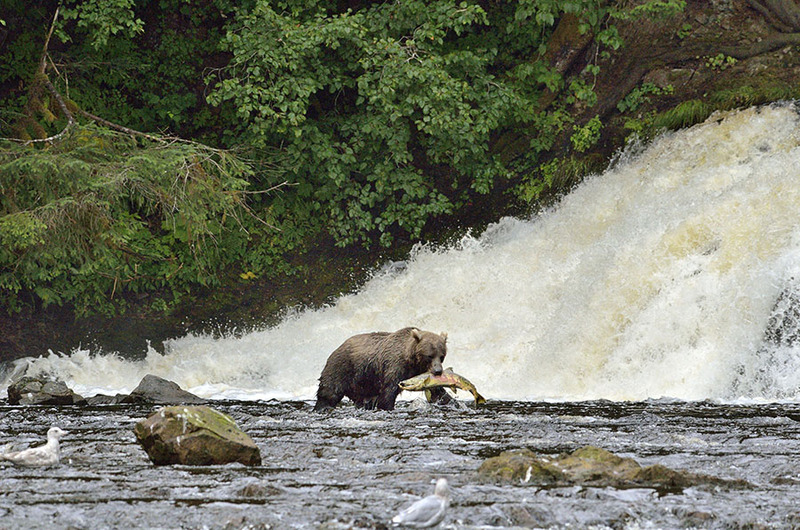 We lucked out with continued great weather – it has been a very warm and dry summer up here, which is not good for the salmon. But it sure is pretty. 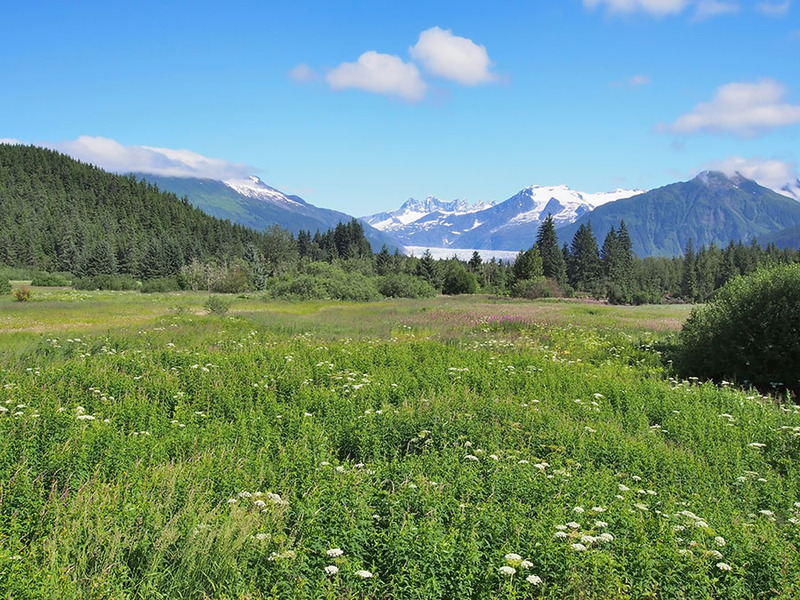 Here’s a view of the Mendenhall Glacier across a field of wildflowers. 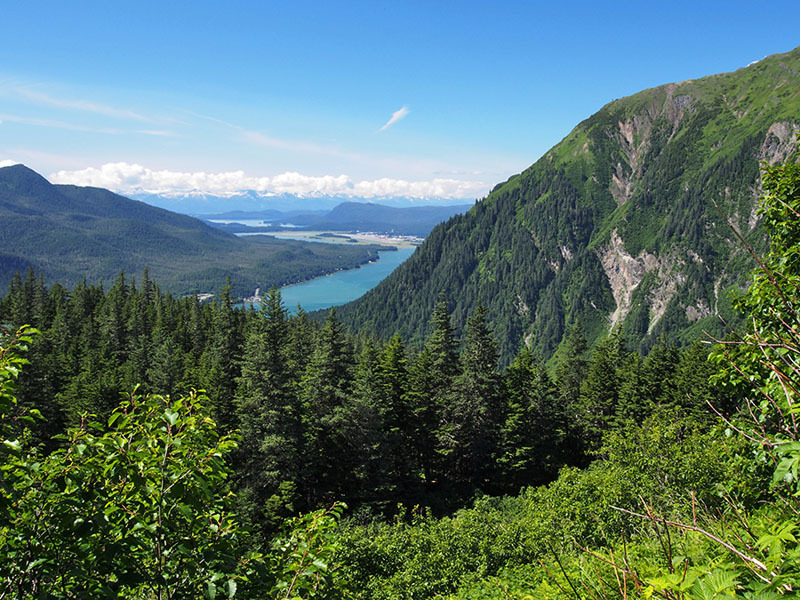 We’ve seen the Mendenhall many times, but if we have a rental car we always go up to check out the ranger lectures at the Visitor Center and to hike the trails. 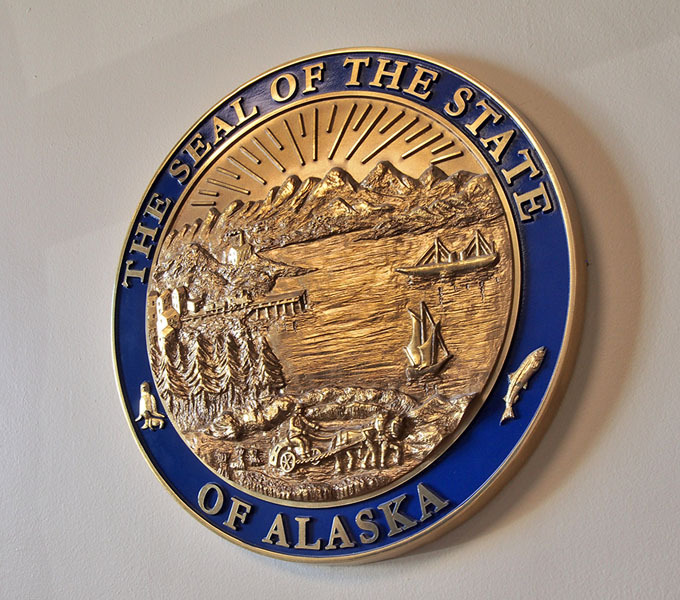 This trip we also stopped to take a self-guided tour of the Alaska State Capitol – something we’ve not done before. It’s not a very fancy building, as Capitols go, but there’s a lot of wonderful artwork on the walls from all over the state. There’s no security, no receptionist (except at the Governor’s office – she was very nice), and it’s all just very laid back. 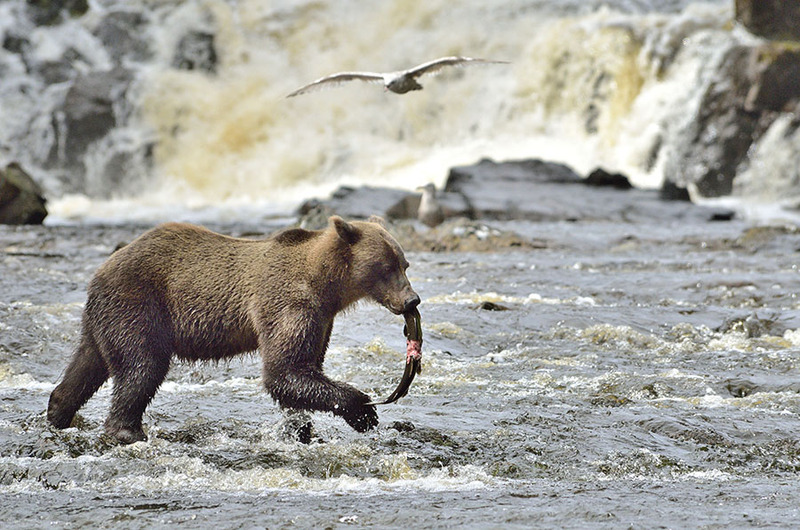 Very Alaskan. 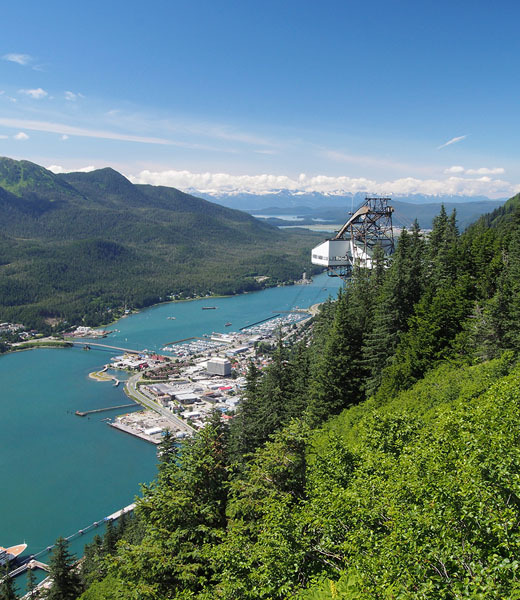 The weather was just too nice not to take the tram up to the top of Mount Roberts… …and the visibility was so good we could see all the way to Auke Bay!